A while ago I was looking for a new title of Mircea Eliade. I ran into “Man and Time”, a title with essays of a variety of authors including Eliade. My eye fell on the names Gilles Quispel and Gerardus van der Leeuw, which made the title even more interesting. Oh yes, Carl Gustav Jung is also in it. Oh well. When I received the book I saw that it has been published in a series (number 3) as English versions of the famous Eranos Jahrbücher, so certainly Jung was in it! I never knew that these Eranos books were available in English. 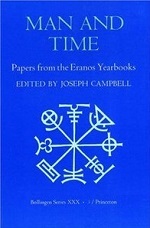 “Man And Time” contains texts from the meetings of 1949 and 1951. The Eranos group was a group of scholars who came together once a year. I always thought that these meetings took place in the house of Jung and that the scholars were psychologists with a black sheep here and there. Actually it was a group of scholars of a varried breed, meeting in the house of Olga Froebe-Kapteyn with as goal to get to know each other’s disciplines and learn from each other’s insights. A good initiative! “Man and Time” contains lectures of Henry Corbin, Erich Neumann, Henri-Charles Puech, Louis Massignon, Helmut Wilhelm, Helmuth Plessner, Max Knoll, Adolf Portman and the authors that I already mentioned. You get very different views on the concept of time. From the concept of time in different religions/currents (Gnosticism, Puech; Patristic Christianity, Quispel; Islam, Massignon; Mazdaism and Ismailism, Corbin; Indian thought, Eliade and the I Ching, Wilhelm), relations between time and art (Neumann) and time and death (Plessner) and a highly scholarly scientific history of Knoll. The latter is so technical that I have not even read it entirely, but Knoll perfectly shows what the Eranos group is all about when he flies from psychology to biology to mythology to meteorology. I personally prefer the Eliade approach with mythological time and Gerardus van der Leeuw at the end has a very nice lecture of primordial time. A thing to note is that this book contains Jung’s famous text On Synchronicity and I must say that in most essays the psychological undertone is quite heavy, so my prejudice was not entirely unfounded. Nonetheless an interesting book to read when you are interested in scholars who threw away their blinders.